An austringer is a keeper of goshawks. It’s a rare word now, though some falconers keep it alive, out of historical sentiment as much as anything, I’d guess. It’s in part bound up with the technical distinction between a hawk and a falcon — the true hawks (the accipiters) are in general smaller than the true falcons (in the genus Falco) and have shorter and more rounded wings; hawks usually prefer to hunt by chasing their prey at low level, while falcons stoop or plummet down on it from above. In English tradition, the two birds that exemplify the types are the goshawk and the peregrine falcon. In medieval times, falcons had higher social status than hawks (though the claim often made that your rank determined which type of bird you could fly seems to have been invented in the fifteenth-century Boke of St Albans). 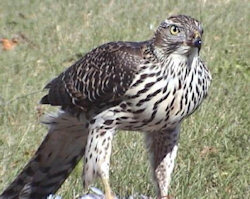 As a result, falconer seems to have been an upper-class word, with hawker used for the lower classes who hunted with goshawk, sparrowhawk or kestrel (confusingly, this last bird is actually a falcon, not a hawk, though it hunts differently from the other falcons and so was classed with the hawks); in time falconer has become the general term for a person who trains and hunts with any bird of prey, including buzzards, eagles and owls (the existence of another sense of hawker, for a travelling seller of goods, with a quite different origin, has probably been a factor in its decline in this sense). Quite why the keeper of just one species, the goshawk, should have been singled out by giving him yet another name isn’t clear. Austringer has sometimes been written as ostringer, or astringer (this last form turns up in a stage direction in Shakespeare’s Love’s Labour’s Lost: “Enter a gentle astringer”). All of these spellings are modified forms of the older ostreger, which comes from French ostricier, ultimately from Latin accipiter, a hawk. Last modified: 23 August 2003.